Belize NMS: Tropical wave has crossed the country, and a significant decrease in moisture is expected during the next 24 hours. 24-hour forecast: Sunny with some cloudy periods today and partly cloudy tonight. Showers or thunderstorms will be isolated mainly over inland areas this afternoon, and then over the south this evening and tonight. 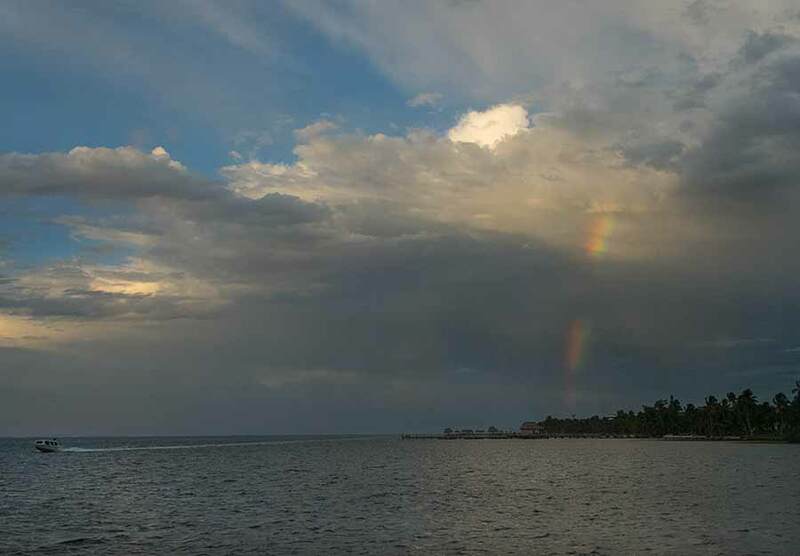 General Outlook: For Thursday and thursday night is for a few showers and thunderstorms developing late during the day over the mainland, and continuing during the night mostly over southern and coastal areas. Today E-SE 10-20 kts Moderate 4-6 ft A FEW SHOWERS CONTINUING THIS MORNING, DECREASING. Tonight E-SE 10-20 kts Moderate-Rough 4-7 ft ISOLATED SHOWERS OR ISOLATED THUNDERSTORMS MAINLY OVER THE SOUTH. Tomorrow E-SE 10-20 kts Moderate-Rough 4-7 ft AFTERNOON SHOWERS OR THUNDERSTORMS. Outlook E-SE 10-20 kts Moderate-Rough 4-7 ft THURSDAY NIGHT:- A FEW SHOWERS AND THUNDERSTORMS. Scatterometer data along with surface observations show fresh to strong winds across the south-central Caribbean while altimeter data indicate seas to near 11 ft with the strongest winds. Fresh to strong trade winds will persist in the central Caribbean with winds reaching near gale force at times in the S central Caribbean. Winds are expected to reach minimal gale-force by Fri night. Moderate to fresh trades will prevail elsewhere, pulsing to fresh to strong at times in the Gulf of Honduras. A tropical wave is moving across the eastern Caribbean while another wave is exiting the west Caribbean and enhancing convection west of 85W. Please, see the Tropical Waves section for more details. SW winds ahead of an upper-level trough extending across the Straits of Florida into the Yucatan Peninsula is transporting abundant upper level moisture from Central America across the NW Caribbean into eastern Cuba. To the south, scattered moderate to strong convection is noted over the SW Caribbean, likely associated with the proximity of the monsoon trough south of 12N and west of 80W. 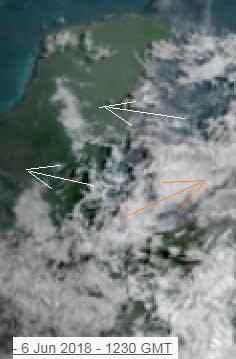 This convective activity is affecting parts of Panama and Costa Rica. Moisture will remain high across this area over the next couple of days, keeping the likelihood of more convection. On Ambergris Caye this morning we have scattered rain showers with a wind from the Southeast at 6 mph. The expected high for today is 88 f. The sea around our barrier reef is calm. A very big change. Most of that mid level and high level cloud from the SW causing all that rain has now cleared. The easterly Caribbean wind with some cloud in now the main weather, although there is a small swellup just north of Belize City this morning. 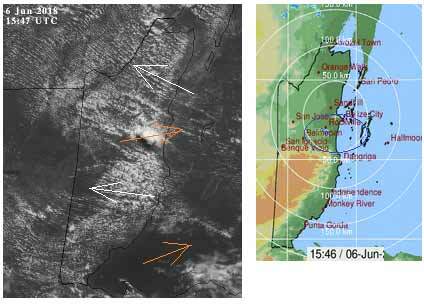 Cloud is already building up along the north coast line. Looks like much of today will be sunny for a change, but with white clouds building this morning, there could be the odd rain shower around at any time today. The Cloud & rain picture. 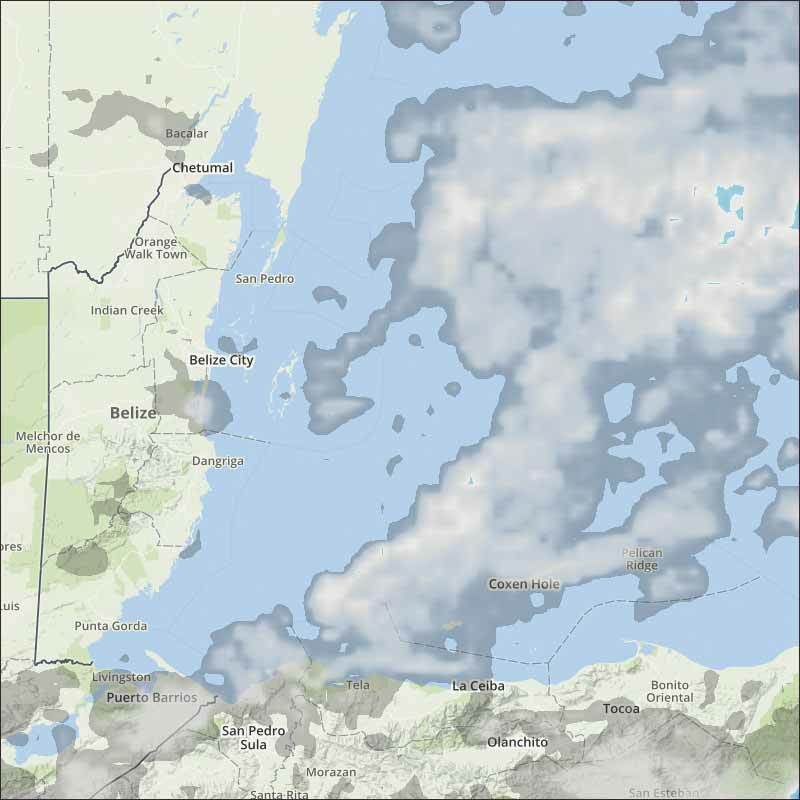 There is some rain about, particularly central Belize.